Have you ever been on a ward round and pretended to know what everyone is talking about, nodded intelligently, used the right terminology and then proceeded to shamelessly ask what that was all about at the end of the day? What is an ECMO weaning study? Specifically for VA (VV ECMO wean does not involve echocardiography), it involves a series of assessments, looking at echocardiographic features, haemodynamic changes in response to a gradual reduction in VA ECMO support. Why do we need to perform weaning studies? Well, for one, patients cannot stay on ECMO support indefinitely. To assess LV recovery and the need for further ECMO support. Recognize previously unidentified RV impairment. Can be done with TTE or TOE. Involves a reduction in ECMO blood flows (preferably in a stepwise manner) and assessing the echo and haemodynamic changes in response to this. Ensure adequate anticoagulation and volume status. Predictors of likelihood of successful wean of ECMO. Bear in mind, this is not dissimilar to predictors of extubation success. The natural history of the underlying disease needs to be factored in, the presence of multi-organ failure, comorbidities and the therapeutic options in the event of ECMO wean failure need to discussed, prior to decannulation. These numbers do vary from one institution to another and as frequently not published. The one thing that is invaluable is patience and systematic approach during the weaning process, and observing the heart’s ability to compensate throughout the process. The VA ECMO return cannula sits in the descending aorta and it pushes in 3 to 4 L of blood towards the heart. This causes an increase in afterload in a failing heart. In the acute phase, the heart is allowed to ‘rest’ but not be completely inactive as this increases the likelihood of thrombus formation. As the heart starts to recover by contracting a bit more, the reduced ECMO flows with a weaning study, will result in a reduction in afterload but an increase in venous return. This can place an acute volume load to the right side which if the cardiac function is inadequate, may lead to RV dilation and impairment. Signs of LV dysfunction should also be sought (Worsening hypoxia due to pulmonary oedema, elevated left and right sided filling pressures and worsening RV failure – SpO2, HR, rising CVP, PA diastolic pressure). There is limited evidence supporting or refuting the utility of systematic weaning studies. Published data are limited to single centres and are referenced below. This is a patient who was put on VA ECMO following cardiogenic shock from cardiomyopathy. What does this TTE subcostal view show? 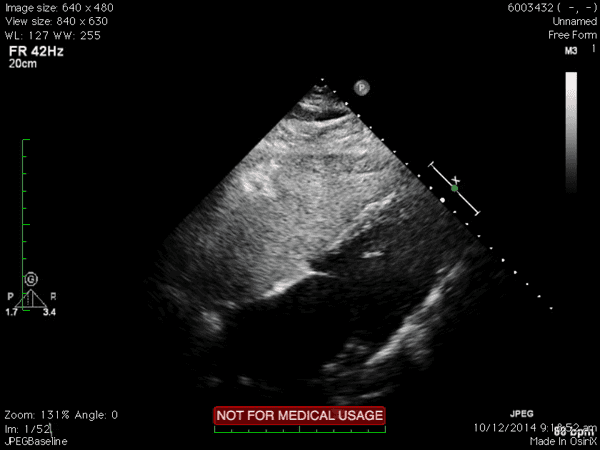 What is all the echogenic material in the RV? 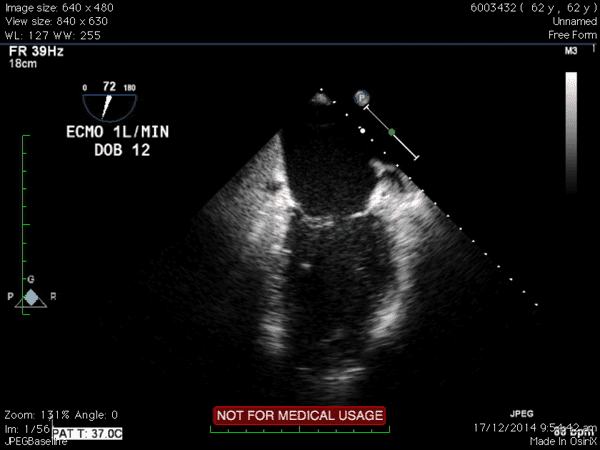 The echo shows a severely impaired biventricular systolic function with an estimated EF of about 10%. 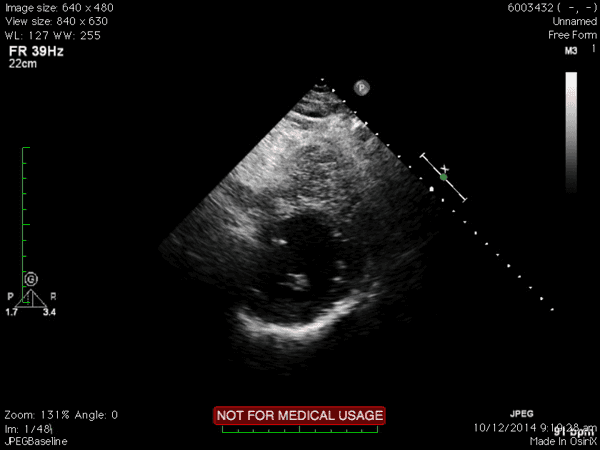 Both atria appear dilated.The echogenic material was albumin 4%, given as a fluid bolus prior to the start of the study. 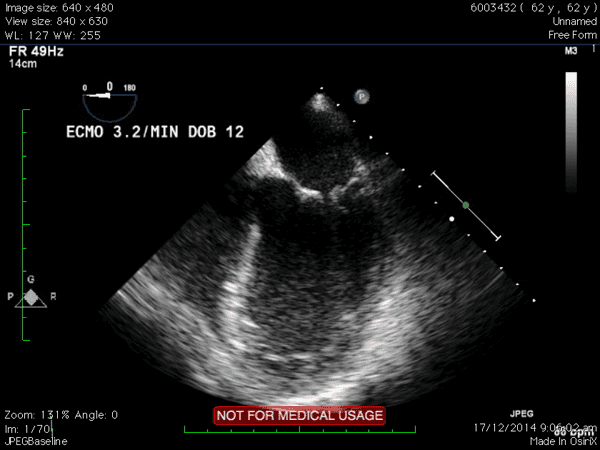 Would you have given this patient more fluid for hypotension in view of the echo findings? SC SAX view confirms an impaired and dilated LV with no wall motion abnormality at the mid papillary view. Cardiac output would be unlikely to improve with more fluid in this setting. LVOT VTI in TTE A3C view. An expected VTI in someone with normal LV systolic function would be generally be greater than 16cm. After 7 days on ECMO support, a weaning study was performed with sequential ECMO flow reductions on dobutamine infusion. A TOE was performed. 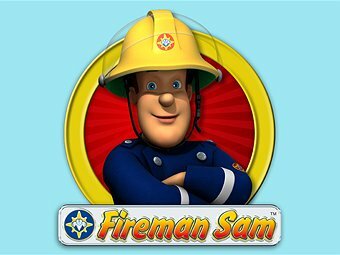 What does this loop show and how could the image be optimized? This is a 5 chamber view with a focus on the LV. As the aortic valve is in view, the TOE probe could have been inserted a couple of cm more with small retroflexion of the probe to avoid foreshortening the ventricle. The LV is dilated with still some LV systolic impairment, but much improved in comparison to the first study. Not quite a true two chamber view but the walls appear to be contracting well. On the basis of the weaning study PLUS other clinical factors ( no organ failures, no pre-existing co-morbidities, serial echocardiographic improvements), the patient was decannulated and was discharged home a month later with no complications. Aissaoui N, Luyt CE, Leprince P, Trouillet JL, Léger P, Pavie A, Diebold B, Chastre J, Combes A. Predictors of successful extracorporeal membrane oxygenation (ECMO) weaning after assistance for refractory cardiogenic shock. Intensive Care Med. 2011 Nov;37(11):1738-45.